Christine Bersola-Babao is passionate about business, and it shows in her remarkable resourcefulness as an entrepreneur. In fact, the media personality dubs herself as a "serial mompreneur." "Ang tawag sa akin 'serial mompreneur' kasi marami akong business," Christine told PEP.ph (Philippine Entertainment Portal) during the Globe myBusiness x PEP.ph Star Bazaar at SM Megamall Event Center on August 17. So far, Christine has four businesses under her belt. 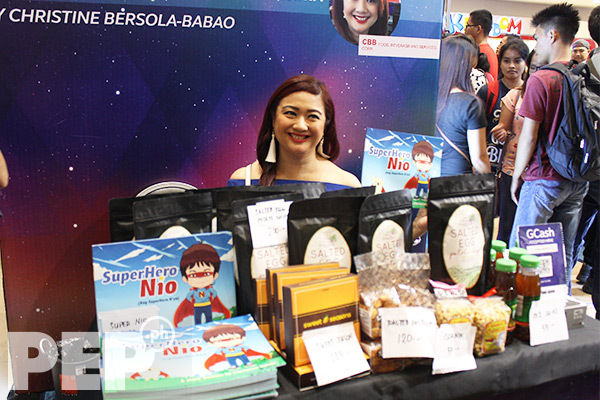 At the Star Bazaar, the veteran television host-producer put up her CBB Food, Beverages and Services, Corp. at her booth. CBB Food Corp. championed locally made, all-Pinoy food products that she described as "under the radar." She said, "I distribute. I don’t bake my own food, I don’t make my own food, I don’t cook my own food," Christine continued, elaborating on her business. "I find brands na under the radar, baguhan, or wanting to be established, and then I sell them to supermarkets, sa mga bazaars." Christine also organized her own bazaars via CBB Events to promote these food products further. She has mounted quarterly bazaars and quarterly food fests. Apart from selling goods, the mother of two also has written and published her own series of books via CBB Publishing. "That's what I do," she remarked. "Kaya marami akong business! Kaya ako serial entrepreneur." Aside from bazaars and food fests that cater to her market's appetite, Christine has also put up Styled Pop-up Store, a concept that she said has become a rage in the U.S.
"Uso yan sa States, yung pop-up store concept," she told PEP.ph "Di ba hindi siya permanent na puwesto? "Parang siya bazaar, pero ang bazaar kasi tatlong araw lang, di ba? Ito mas matagal, one month, two months, three months. And then magbabago ulit yung set of vendors. "I manage two pop-stores in luxury malls. One is Shangri-La [in Ortigas Center], other is Uptown Mall [in Bonifacio Global City]. "Para iba rin yung market kasi ng luxury malls, yung purchasing powers malakas. May isang customer bibili, anim, walo, ganyan. Malakas ang purchasing power. "Dito, kapag mall bazaar, volume [ng tao] yan. Kailangan maraming tao 'tapos maraming bibili. "May isang tao bibili cornick, kapag sa Shangri-La yan, bibili anim na cornicks. "Iba yung market. You have to define your market." And since Christine situated her store in luxury establishments, her goods had to be just as luxurious. "We have three merchants na pure diamonds ang binebenta. Diamonds, platinum, gold—totoo! Hindi fashion jewelry, ah? "Makikita mo kapag iba yung market, iba rin yung goods." Christine has a set goal when building her businesses: make the business thrive and expand. Has it been difficult? "It’s easy when you love what you’re doing," she said. "Di ba sabi nga nila, pagka gusto mo, may paraan. Kapag ayaw mo, may dahilan. Ako laging may paraan, lagi akong may time for it. "...So when you have a goal, you do everything to get that goal."